Davias and Harris are wowing them again this week at the Geological Society of America. I will try and get a hold of their wonderful presentation and post…..
Pleistocene Epoch cosmic impacts have been implicated in the geomorphology of two enigmatic events. Remarkably, in both cases spirited debates remain unsettled after nearly 100 years of extensive research. Consensus opinion holds that the Australasian (AA) tektites are of terrestrial origin despite the failure to locate the putative crater, while a cosmic link to the Carolina bays is considered soundly falsified by the very same lack of a crater. Likely >100 km in diameter, these impacts during geologically recent times should be readily detectable on the Earth’s surface. The improbability that two craters have eluded detection informs a hypothesis that a single impact at ~786 ka generated AA tektites as distal ejecta and Carolina bays as progeny of proximal ejecta. The AA astroblem search is focused on SE Asia despite a strewn field encompassing >30% of the Earth’s surface. This spatial scope implies to us that interhemispheric transits should be considered, as does findings that AA tektites were solidified in a vacuum, then ablated on re-entry at ~10 km sec-1. A Coriolis-aware triangulation network operating on the orientations of 44,000 Carolina bays indicates a focus near 43ºN, 84ºW. 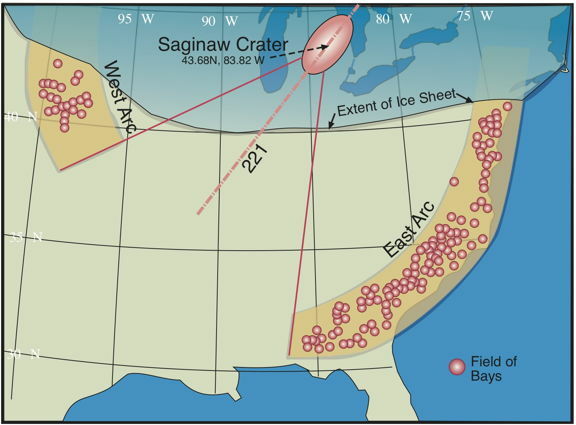 Referencing the work of Urey and Lin, we propose that a near-tangential strike to the Earth’s limb generated the 150 x 300 km oval depression that excises Saginaw Bay and opens Michigan’s Thumb. That region was likely buried under deep MIS 19 Laurentide ice at 786 ka. Schultz has shown that oblique impacts into continental ice sheets yield non-traditional astroblems, and multiple glaciations have since reworked this site, making identification more challenging. Hypervelocity gun tests show that oblique impacts produce a vertical plume of ejecta, biased slightly down-range. Ballistic trajectories reflecting such a plume deliver tektites to all AA finds when lofted at ~10 km sec-1 and parameterized with the proposed depression’s location and 222º azimuth. Chemical and isotopic characteristics of AA tektites suggest they were sourced from sandstone and greywacke of Mesozoic age, which is congruent with Michigan Basin strata lost when The Thumb developed. The distribution of proximal ejecta may explain anomalous pulses of regolith in moraines and sediment loading in regional drainage basins recently dated ~800 ka using 10Be/26Al methods. Saul/Paul on the Road to Damascus: Cosmic Airburst?